A few tips for making these eggs: If you find the peanut butter dough too sticky to work with, place it in the fridge for a few minutes to firm up a bit. Working quickly also prevents the dough from sticking to your hands. If you have trouble shaping the dough into eggs, try molding them directly on the baking sheet. Also, dipping the eggs in chocolate is much easier if they are very cold and completely firm (place them in the freezer if you need to). Place the peanut butter, butter, and light brown sugar in a medium saucepan. Cook over medium heat, stirring constantly until the mixture is completely melted and just starts to bubble. Take the saucepan off the heat and stir in the vanilla extract. Then stir in the confectioners sugar, 1/4 cup at a time, stirring well after each addition. Taste the mixture and stir in as much salt as needed to balance out the sweetness of the mixture. Set aside to cool to room temperature. Line a baking sheet with parchment paper. 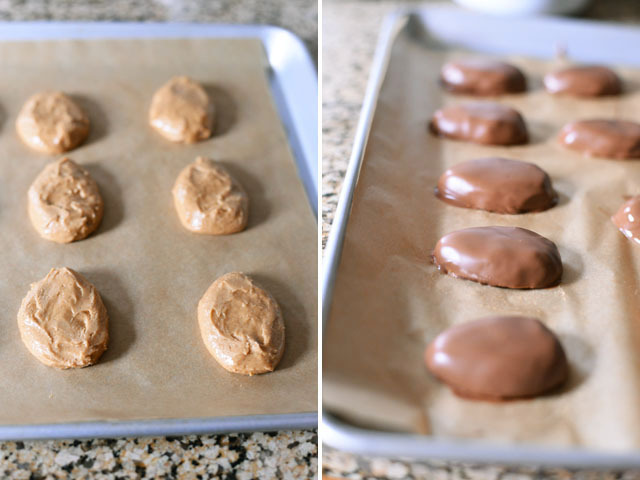 Once the peanut butter mixture has cooled, take about 2 tablespoons of dough at a time, shape them into eggs, and place them on the lined baking sheet. Once all the eggs are formed, place the baking sheet into the fridge until the peanut butter eggs are firm, about 30 minutes. Once the eggs are firm, make the chocolate coating. 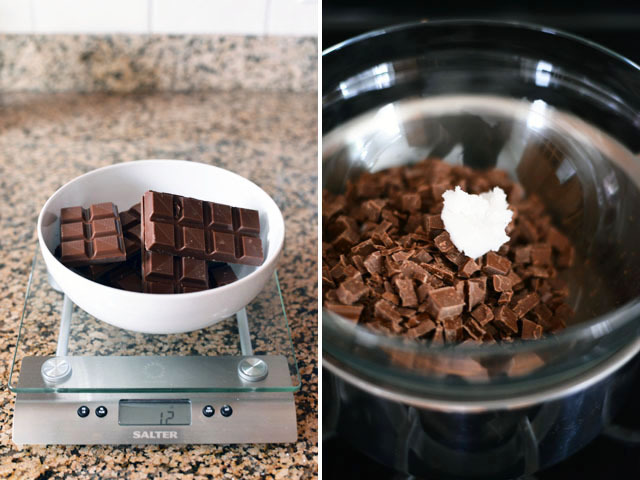 Place a glass bowl over simmering water to create a double boiler (making sure the bottom of the bowl doesn’t touch the water), and melt the chocolate and coconut oil together, stirring constantly. Once completely melted, remove the bowl from the heat. One at a time, drop the eggs into the chocolate and use a fork to turn the eggs to coat them completely. Use the fork to scoop up the eggs, holding them for a few seconds to drain off any excess chocolate, and place them back onto the lined baking sheet. 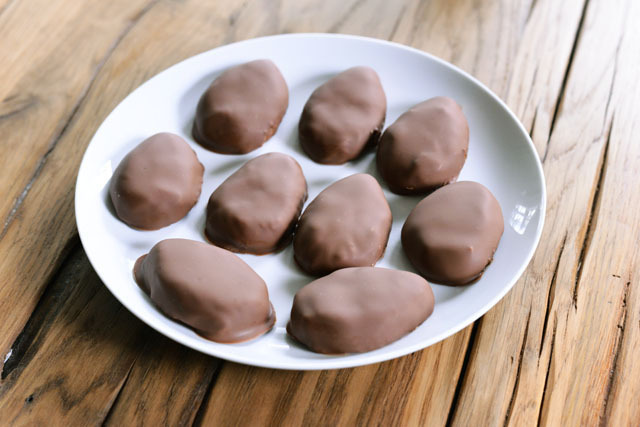 Once all the eggs are coated, return the baking sheet to the refrigerator until the chocolate has hardened, about 30 minutes. Makes about 15-20 eggs depending on size. I think we all love those peanut butter eggs in the yellow packages! I didn’t but any Easter candy this year and my family has expressed their opinions on my oversight! 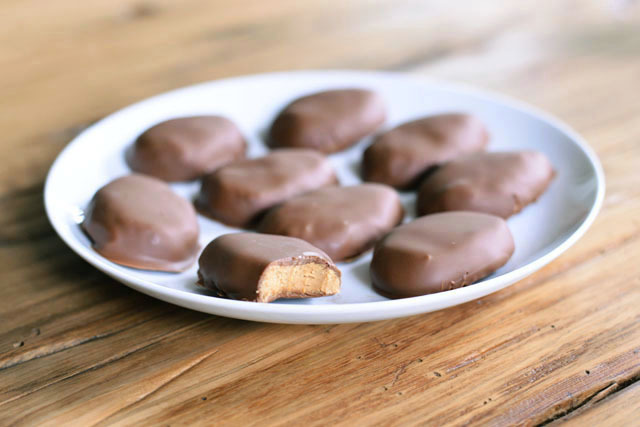 Making your own peanut butter eggs, with ingredients you recognize is a much better holiday treat! These look so great! It is so hard to resist Easter candy – I love the idea of making your own so that it is at least a little guilt-free!